During the days of civil war in Ukraine, many funds are trying to help refugees by sending emissaries to the Donetsk region. Some of the most persistent get to Donetsk and Lugansk. However, Victoria, an employee of the charity fund “Predanie.ru” decided that her help was needed at the war front – and fearlessly went to the besieged city of Slaviansk. Slaviansk can be reached on the highway that connects it to the city of Izum. Even for locals, this trip involves seriously risking one’s life. “When we were driving to the city, a shell exploded right in front of our car. The driver was scared to death, and I can understand him,” relates the volunteer. According to Victoria, both Ukrainian troops and the militia allowed the volunteers to pass freely through the roadblocks. It is difficult to imagine the disaster inside the city, said Victoria. “Slaviansk is gradually sinking back into the Stone Age. There is no electricity. I couldn’t charge my camera’s battery and my computer is also useless. I’m not even talking about the other electronic devices,” relates the volunteer. 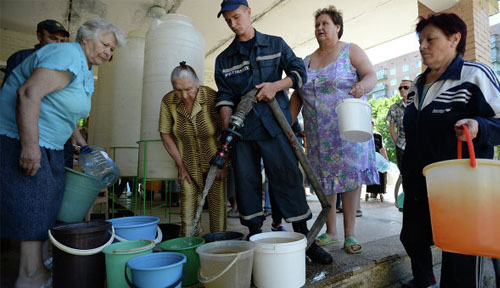 After the peace truce’s end, Slaviansk still has problems with water. “People here buy water in stores, although they have no money. I brought along two large flasks,” says Victoria. It is hard to say how many people are left in the city. “During the day it seems as if Slaviansk is a ghost town. Only some elderly women sit on the benches in front of their homes. Many literally live in basements,” relates the volunteer. Despite the current martial law, help comes for civilians. “Some things are brought by the militia, some by the Orthodox Church, and non-Orthodox churches also help—there are many here,” notes the fund’s employee. This war, which began so suddenly, struck the residents of the eastern Ukrainian city. “People here aren’t used to war, they’ve lived quietly for a long time,” asserts Victoria. 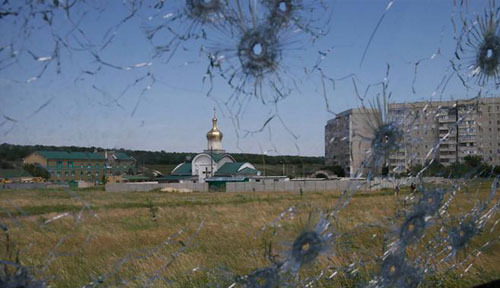 Due to the confrontations between the militia and Ukrainian military forces, many have tried to leave the city. Slaviansk residents are assisted by all kinds of people who belong to different ideological camps. “I don’t know exactly who they are. They are representatives of the Church and locals—simply people of good will,” relates Victoria. According to her, in spite of a common goal, it is difficult to establish communication between different groups of volunteers. “Slaviansk, contrary to common belief, is a fairly large city and cooperation is difficult,” states the volunteer. Victoria promises to answer soon the question of how the people of Slaviansk and other cities can be assisted in leaving the combat zone.